There are tonnes of counterfeit designer fashion products floating around on the market. It’s really important that you know how to separate real deal from fakes, to ensure you get your money’s worth when shopping for designer labels. LUXE Models explains how to spot fake fashion. Production location can be a big indicator of fake fashion. A lot of counterfeit clothes and accessories are made in Asia, due to cheaper production costs, so if the label on your Hermes scarf says “made in China,” it probably isn’t real. The majority of designer fashion goods are made in Europe, home to global fashion capitals such as London and Paris, and pieces will include engravings stating this. Read this article in full with LUXE Models. Halloween is upon us once more. As a fashionista, this night presents you with a conundrum. How can you wear a really scary costume, without falling foul of the fashion police? Here to lend you a helping hand, LUXE Models reveals five tips for stylish Halloween costumes that you should try this year! The wider you spread your net, the more likely you’ll be to find chic Halloween costumes. With the arrival of the digital age, you’re no longer limited to just high street retailers, as these days you can buy clothes online too. When shopping for Halloween costumes, ensure you look at online fashion retailers like ASOS, Boohoo and Net-A-Porter, to find fabulous, but scary pieces at even better prices! In order to give yourself the best chance to become a model, you should first find a role model, to show you how to carve out a successful career in one of the world’s most exciting industries! If you’re looking for modelling success stories, find out more about Adriana Lima, who during her career has become a true industry titan! Adriana was born in 1981, in the Brazilian city of Salvador. Growing up, Adriana never saw herself becoming a model, despite the fact that she won beauty contests at school. According to Maybelline, a make-up brand Adriana later worked with, the Brazilian beauty’s career began when she was just 13. The future model was discovered at a shopping mall. At just 15, Adriana triumphed in the ‘Ford Supermodel of Brazil’ contest, going on to place second in the ‘Ford Supermodel of the World’ competition. With this validation, Adriana decided to move to global fashion capital New York and before long, she was signed with Elite Model Management, one of the top modelling agencies on earth. Read the article in full with LUXE Models. Do you want to become a male model? Look at Zayn Malik for inspiration. With his gorgeous looks and on-point sense of style, it was only ever a matter of time before the 'Pillow Talk' singer took the world of fashion by storm. Zayn's fashion work first came to LUXE Models' attention when in September, he joined stars like Twilight actress Kristen Stewart in fronting Elle magazine, making waves all around the world. Zayn's meteoric rise was confirmed by Business of Fashion, a sector publication, when they recently named him one of fashion's most influential people. Zayn is now considered as influential as major models, designers and trendsetters ranging from Gigi Hadid, his supermodel girlfriend, to iconic Vogue Editor Anna Wintour, who has re-defined fashion during her tenure in this post. Where next for Zayn? You can read this article in full with LUXE Models. The Karl Lagerfeld-designed Chanel show was undoubtedly a highlight of the recently-held Paris Fashion Week Spring/Summer 2017. For the event, the iconic designer transformed Chanel’s runway into a data centre, showing the rising influence of technology in fashion. Paris is a true global fashion capital. This was the city where Haute Couture was invented and the place where legendary designer Coco Chanel pushed the boundaries of fashion. Many of today’s top fashion houses, from Chanel and Dior to Givenchy and Vuitton are based in Paris today. Twice every year Paris holds Fashion Week, where top designers come together to reveal the latest trends. During Paris Fashion Week Spring/Summer 2017, we saw that statement coats, experimental sleeves and feel-good fashion are all set to become stylish. It also became clearer that Paris is becoming a major fashion innovator, with designer like Karl Lagerfeld pushing it to the next level. Read the article in full on LUXE Models. At the recently-held London Fashion Week Spring/Summer 2017, we learned that tea dresses are set to be huge next season. To help you nail this trend, LUXE Models reveals five style tips. Tea dresses show off the lower parts of your legs, so you need to think about what to do here when styling these pieces. Tea dresses can work with tights, but they’re often best with bare legs, especially in spring and summer. Another big issue you’ll need to consider here is shoes. To make the most of tea dresses, try pairing them with fun strapped sandals in summer and killer, thigh-high boots in winter! Rounding off Fashion Month Spring/Summer 2017, Paris Fashion Week was eventful to say the least. LUXE Models reveals five highlights from Paris Fashion Week Spring/Summer 2017. Kim Kardashian stunned at the Balmain show. The reality TV star, who sat on the front row, rocked a risqué metallic, knit-fishnet floor-length dress which left almost nothing to the imagination. Sparking headlines around the world, we’re sure this fabulous piece, along with other Balmain highlights, such as jewel-toned snake prints and rainbow crocheted clothes, will be everywhere next season. Reality TV star Kim Kardashian-West is one of the most famous fashion icons on earth. Everywhere she goes, Kim attracts the spotlight and sparks tabloid headlines. It should come as no surprise then, that Kim absolutely stole the show at the Balmain Paris Fashion Week Spring/Summer 2017 event. Kim Kardashian is rapidly becoming a style icon. As an example, remember when Kim unveiled a new ‘do, dying her luscious brunette locks vivid blond? Kim’s radical hair change made headlines the world over, showing just how much influence she has on the global fashion scene right now. Kim Kardashian also has something of a penchant for shocking people. Who can forget the time Kim broke the internet by showing off her famous derrière on the cover of Paper Magazine? We especially loved that shot of Kim in a sequined black dress, popping a Champagne bottle which flowed over her head and onto her booty. So what happens when you combine Kim’s chic style with her love of shocking people? We found out at the recent Balmain show at Paris Fashion Week. Established in 1946, Balmain is one of France’s most respected Fashion Houses. Balmain’s Paris Fashion Week Spring/Summer 2017 jungle-themed show was a sight to behold, according to Vogue. During the event, top models like Gigi Hadid rocked a range of ultra-cool trends, from asymmetrical bra-tops and jewel-toned snake prints, to daring cut-out dresses and rainbow crocheted pieces. But while the Balmain event was a triumph, attendee Kim Kardashian stole the show. Kim was seated on the front row (obviously) of the Balmain display, between mum/manager Kris Jenner, sister/co-star Kourtney Kardashian and CR Fashion Book Editor-In-Chief Carine Roitfield. All four women sported glamorous looks at Balmain, but only Kim managed to generate more headlines than the event itself. Why? Kim rocked up to the Balmain showcase wearing what USA Today describes as “a metallic, loosely-knit dress that left little for the imagination to keep up with.” Daring, yet totally on trend, Kim’s risqué fishnet, floor-length number, which she teamed with killer black wedges, totally worked! Kim Kardashian, we take our hats off to you! Once again, you have shown that you’re a style innovator, always looking to push the boundaries of good taste on everyone else’s behalf! We can’t wait to see how fashion brands and retailers take this soon-to-be-iconic dress and make it work on the high street! If we learned anything from New York Fashion Week Spring/Summer 2017, it’s that yellow is set to be next season’s hottest colour. But this shade is notoriously hard to pull off so you might need a little help rocking yellow. Here LUXE Models explains how to wear yellow with style. Vogue writes that the first step to rocking yellow is finding the right shade. First, determine which tone in the yellow rainbow works with your skin, so your clothes don’t make you look washed out. Then, determine which other colours work with your chosen shades of yellow. Be warned that if you decide to wear yellow-on-yellow, you need to wear two separate shades to make sure that your outfit actually works. With yellow, you need to go hard or go home. The Telegraph reveals that one way to master this difficult shade is to find a strong colour for yellow to stand up against. Try pairing yellow with bold primary colours if you want to play it safe and cultivate a retro look. But if you want to experiment a little, go for weirder pairings like lemon and bubble-gum or mustard and grey! You can’t go wrong by seeing how the experts include yellow in their designs. At New York Fashion Week Spring/Summer 2017, we saw designers use every shade of yellow, from zingy-lemon to mustard, so there are examples for whichever shade you choose. We particularly loved the Thakoon show, which saw muted mustards teamed with fabulous gold statement earrings – a winning combo! Sometimes, yellow shines when it’s highlighted by a muted background. Try teaming neutral, calm colours with one yellow piece. Opt for bright yellow heels or a bag, to make a real statement. But if you want to play it safe, try something subtle like adding a yellow charm to your tote bag. You could also try wearing matching yellow accessories with a neutral outfit to take this look to new extremes! Despite popular opinion, you can pair yellow with black. But you have to be really careful, otherwise you could end up looking like a bumble bee. The trick here is to add in a third colour, so you can break up the sea of yellow and black. Let’s say for instance, you decide to toughen up a yellow dress by throwing on a black leather jacket. Add a coral scarf to be chic and make this look really work! It’s important to point out that yellow is a really happy colour. If you want to find a way to make this tricky shade work for you next season, cast the rule book aside and have some fun. Get experimental and weird because you never know, you could stumble on a really innovative way to wear this most brilliant yet difficult of shades! Fashion month is officially here! It kicked off with New York Fashion Week, and top designers reveal the new trends which are set to hit stores everywhere next season. Here are five things LUXE Models learned from New York Fashion Week Spring/Summer 2017. As a fashion model, you’ll be expected to strut down runways while wearing killer heels. In New York Fashion Week. which ran from 7th to 14th September, we learned that even the most professional of models have trouble with heels. While appearing at the Michael Kors show, the gorgeous Bella Hadid, who was rocking a sparkling ruffled black dress, tripped over her sky-high heels. But like any professional, glamorous Bella got right back up again! We discovered that yellow is destined to be the season’s hottest colour. 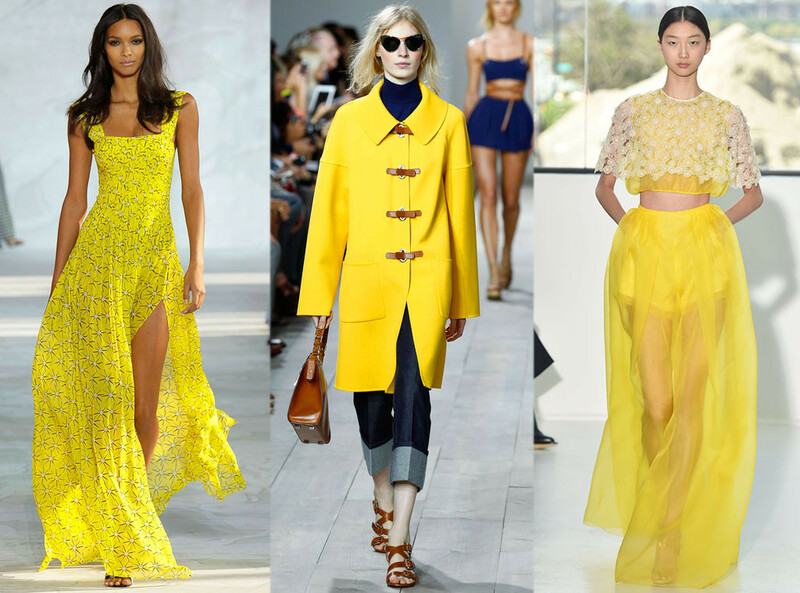 Every shade of yellow, from zingy-lemon to mustard, appeared on the New York Spring/Summer 2017 runways. Alexander Wang caused a real stir by opting for highlighter pen neon yellow while Thakoon raised cheers with a more muted mustard tone, which looked really fresh when paired with statement gold earrings. New York’s catwalks were littered with hot clothing trends. With the latest September fashion covers, we saw that cut-outs are set to be huge and this trend also appeared at Fashion Week. Other clothing trends revealed included deconstructed shirts, which wowed Carolina Herrara’s audience, ruffles and slip-one shoes. Tibi’s black slip-on shoes, which had cigarette lighter-sized heels, were amazing! We saw a ton of new beauty fads which are destined to become trendy in Spring/Summer 2017. Grazia writes that surfer-girl beach hair was a real hit at Alexander Wang’s show, while designers such as Jason Wu confirmed that bright matte lips will be hot next season. Other emerging beauty trends included pastel-wash eyeshadow, neon-orange nails and snapchat filter-inspired beauty accessories. And with that, we wave goodbye to another New York Fashion Week and we’ll see you in London. With a number of respected designers and brands, including Top Shop, Christopher Kane to Burberry set to unveil their new collections at London Fashion Week Spring/Sumer 2017, it’s sure to be epic!